Wearing a riding hat is not just essential to your riding kit, it is an absolute must. Too many people school their horses without hats and it can be very dangerous. Horses aren’t always predictable creatures, despite how well you know them or how placid they may seem. There is always something that can happen which may not even be their fault. For example, a horse in another field playing around and they want to join in, a sudden movement that startles them, or even just a stormy day. Different styles of horse riding hats: The type of riding you will be doing can affect the type of helmet you buy, however, there are a few basic styles that you can choose from. The classic riding hat: This is traditionally covered in black, grey, brown or navy velvet and has a hard peak at the front. 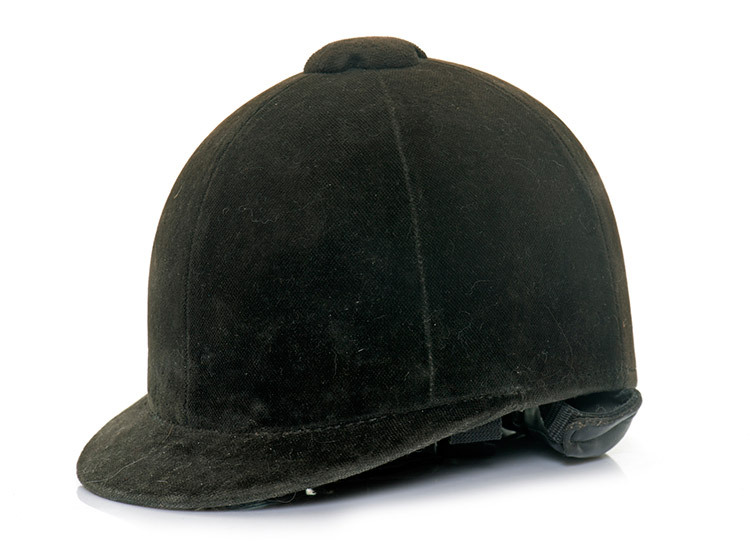 The Jockey Cap: Sometimes known as a skull cap, this riding hat has no peak at the front. It isn’t however just restricted to jockeys and has risen in popularity for those competing and just leisure riders. Peaked covers can be used to cover these hats, and can be in a traditional velvet or brightly covered silks. Skull Protector: This is usually worn in warmer climates or warmer seasons as it is lightweight and ventilated. You should replace your riding hat every three to four years to ensure it is up to standard – even if it looks as good as new. You should almost certainly replace your helmet if you have had a fall, a bash to the helmet in any way or even if it is has been kicked on the ground by your horse. It is always best to buy a new helmet rather than a second hand one, as it can be difficult to detect if it is has been subject to any damage. There are a few things to note when fitting yourself for a riding hat. It must be comfortable and have an adjustable chin strap, but it must at the same time be comfortable and secure. Test the hat without the chin strap fastened – it should still be comfortable but you should be able to shake your head briskly without the helmet moving.